Turn simple beach enemies into prime meat in these easy steps! This is an Ichthyornis with other things for scale. 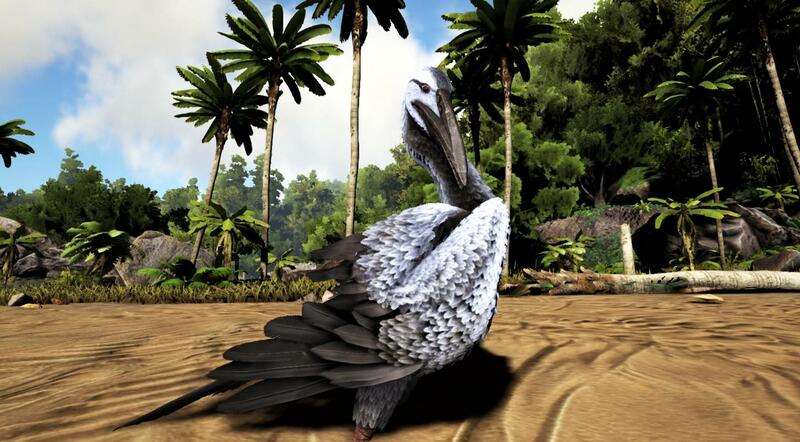 For those who don't know, Ichthyornis are these annoying birds that swoop at you and steal things. They're like pegomastax, but airborne. 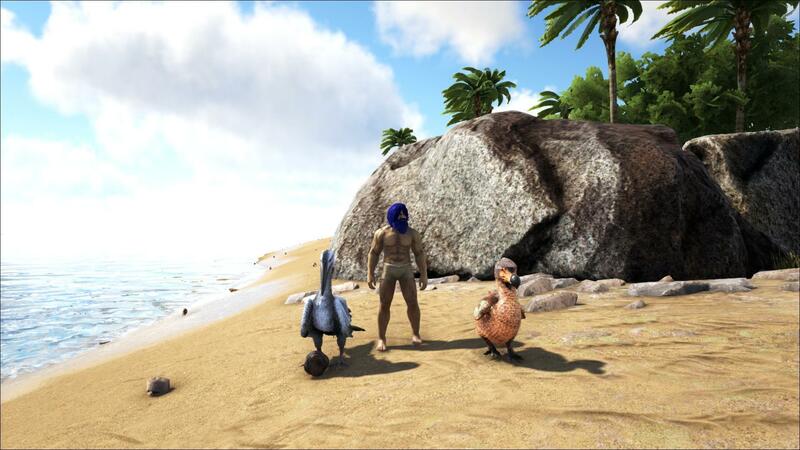 If you can tame one, though, you can get access to an Ichthyornis's other, non-stealing power: Making prime meat. 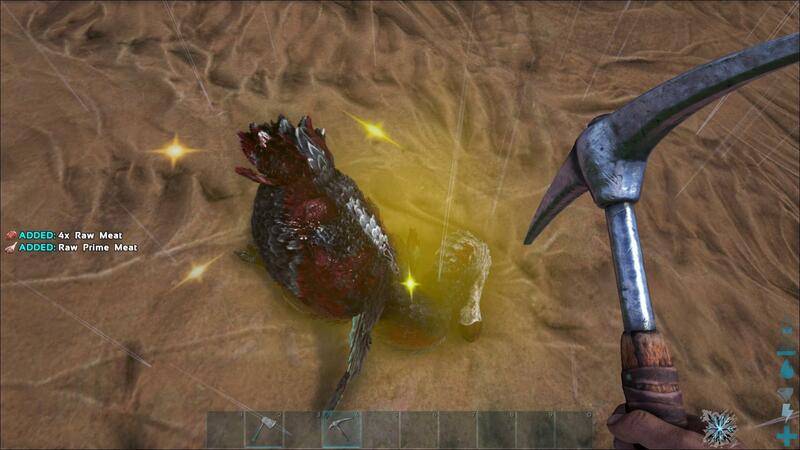 Basically, you can have an Ichthyornis catch small animals for you. The animal corpses will have a buff that makes them drop prime meat, even if the animal is a fish or a dodo. Dodo giving prime meat. The buff makes the corpse glow yellow. Ichthyornis live on beaches and offshore, like most of the other seabirds. You may have to search for a bit. After you have found your Ichthyornis, you need to tame it. The easiest way is to get its attention, and then use a bola. Then, knock it out, but be careful. Ichthyornis have very low health compared to their torpor. Try and be precise, and remember that headshots are 3x the damage. This is a taming information table taken from the wiki page. Results accurate as of 8/26/2017. As you can see, Ichthyornis like Pegomastax kibble, then prime fish meat. Pegomastax kibble is made with Pego eggs, citronal, and raw prime fish. 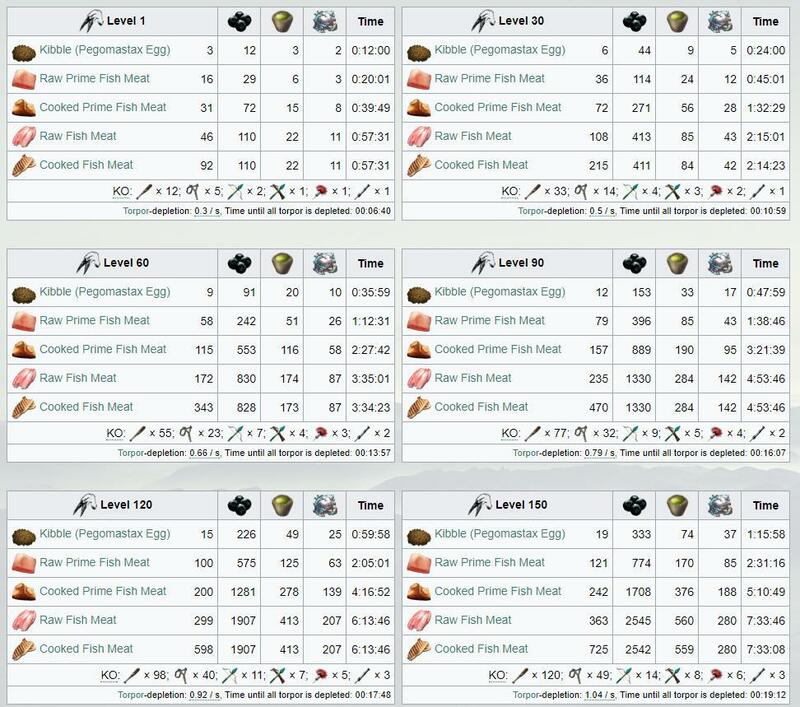 Prime fish meat is easier to get, but if you didn't need a source of prime fish meat, why tame an Ichthyornis, amirite? Did an Ichthyornis steal your stuff? Is an Ichthyornis attacking you? BOTH!? Your best hope is bolas. Get it to chase you, sprint a little ways away, then bola and kill it. If you don't have bolas, either flee before it takes more stuff or use a spear/dinosaur. They have low health, but man they are fast. Now that you've got one, time to put those special golden corpse powers to use. The Ichthyornis can ride on your shoulder. Double tap the F key to throw it. 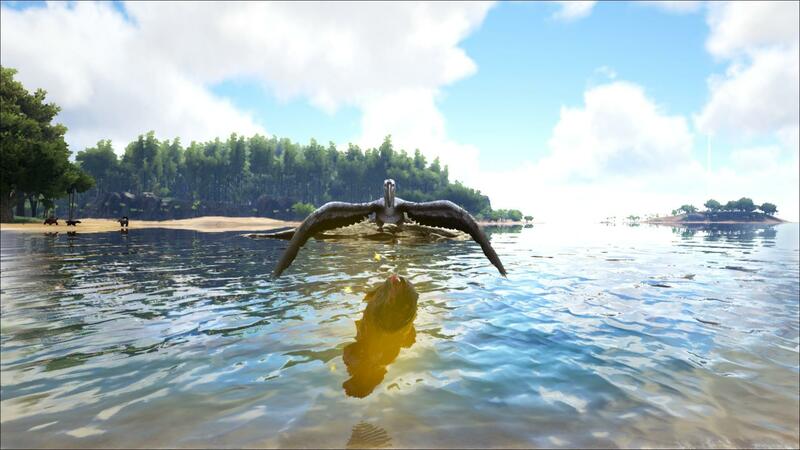 If you throw it while the screen is centered on a dino, your Ichthyornis will attack it. An Ichthyornis holding a dodo. No hunt and hunt are like default settings. 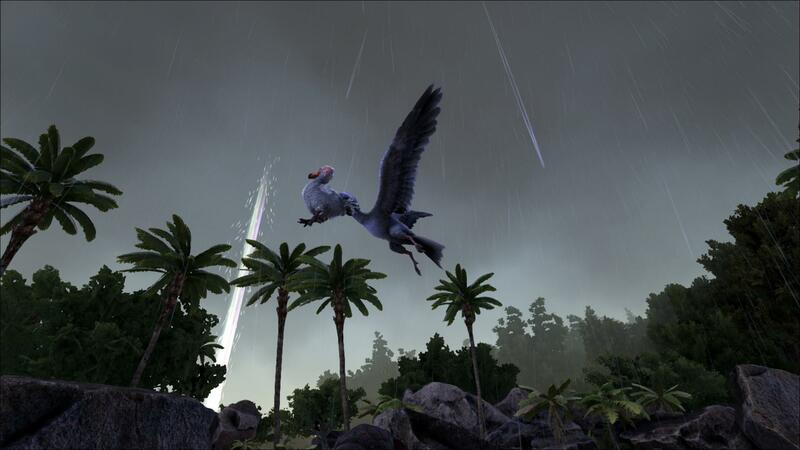 When set to attack a target your Ichthyornis will attack the target, picking it up if it can or dive bombing it if it can't. If the target is being held, your bird will harvest the corpse on its own. Hunt and retrieve is notable for being the way you get your golden prime meat corpse (tm). This only works if your bird can pick up its target. Basically, rather than harvest the corpse, the corpse will glow and the bird will drop it on the ground for you. The glowing corpse will give you prime meat. Ichthyornis gives me a golden fish. sidenote: Your Ichthyornis will often get sidetracked. After it kills its target it will go after other, nearby targets. Best I can tell you just have to whistle it to passive every time. These are the stats of an Ichthyornis, taken from the wiki. If you want your Ichthyornis to be able to protect you/itself, level speed, health and damage. If you want it to just be a good meat enchanter, level damage and possibly speed. If you want it to double as a backpack, level weight.